Download the best stud finder app today! Why pay $20 or more for another tool when you can use Stud Finder on your phone now to quickly and accurately find wall studs? A good stud detector tool is critical for safely and securely hanging large or heavy wall fixtures such as mirrors, shelves, wall mounted displays, artwork, etc. Get the best Stud Finder app for your device today, so you are always prepared to effectively handle any home renovation or DIY project! 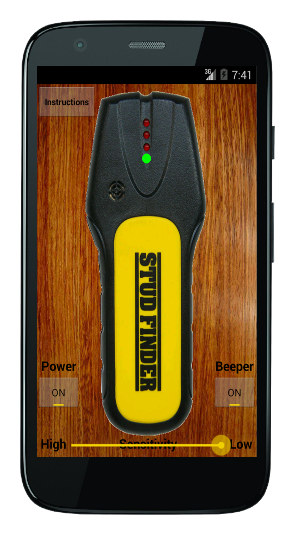 Stud finder app for iOS and Android brings the simplicity and effectiveness of a real stud detector tool to your iPhone or Android device. The app uses your device's compass (magnetometer sensor) to pinpoint metal studs, nails, and screws embedded in all wood wall studs. 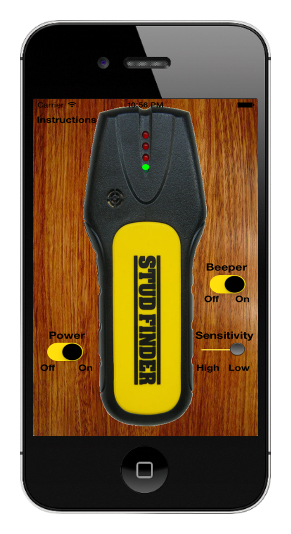 Use studfinder in the same way as other hand-held stud detector devices. The LEDs light up in sequence with proximity to metal studs and fasteners as your device's magnetometer sensor passes over the wall stud. I have spent over five years continually improving studfinder's functionality and usability, based on user feedback. And I sincerely believe it to be the best stud finder app currently available in any app store. Please follow this simple instructional video for how to use stud detector tool. More precise and detailed instructions for how to correctly use the studfinder app on your particular device are easily accessible within the app itself. Please make sure to follow the included guide for how to adjust the app settings for various work environments, use cases, and devices. Thank you for downloading and using the app! Note: Stud finder app cannot detect wood directly but detects metal studs and fasteners within wood studs. It is my continued goal to ensure this is the best stud finder app available. Please contact me personally with any questions, concerns, or feedback and I will do my best to respond promptly.